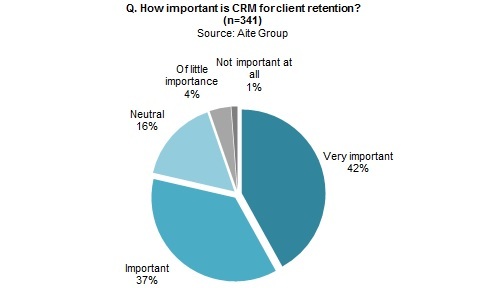 CRM systems are key to understanding clients’ preferences as well as better serving them and meeting their needs. Boston, May 31, 2017 – Customer relationship management has always been an important functionality for wealth management firms across the globe. In the past couple years, CRM solutions have been in high demand as new regulatory pressures have required firms to transparently provide the best service to clients. Furthermore, firms are using CRM solutions as advisor dashboards and central hubs that tightly integrate with other systems, and firms have plenty of CRM technology solutions to choose from in this crowded marketplace. This report profiles 15 of the most important North American CRM vendors that provide core CRM software and that offer wealth management-specific CRM solutions. It is based on Aite Group interviews with major firms in the wealth management space and with technology vendors in the U.S. market between December 2016 and March 2017. Briefings were held with the following vendors to discuss their offerings and demonstrate their CRM technology: Backstop Solutions, Ebix, GoldMine, Grendel, Infor CRM, Junxure, Maximizer, Microsoft, NexJ, Pegasystems, Redtail Technology, Salesforce, Satuit, Unapen, and Wealthbox. This 79-page Impact Report contains eight figures and 47 tables. Clients of Aite Group’s Wealth Management service can download this report, the corresponding charts, and the Executive Impact Deck. This report mentions 4Thought Marketing, Accenture Avanade, Accenture, ACP Pyramid, Actimize, Advent, Advicent Profiles, AdvisorEngine, Advisors Pyramid App (planning), Advizr, Albridge, AllBackoffice Consulting, Alliance of Cambridge, Alphalogix, Aqumulate, ASI, AssetBook, Athene Group, BITtelligtent, Black Diamond, Bloomberg Vault, Blueleaf, BOSS, Brainsell, BranchNet, Broadridge, Buckingham Asset Management, ByAllAccounts, Capgemini, Charles Schwab, Citrix ShareFile, Clarient, Cognizant, ConnectLeader, Constant Contact, Cozyroc, CRM Integration, DataSelf Business Intelligence, DAZL, DNB, Docupace, DocuSign, dotMailer, DST, Eloqua, eMoney Advisor, Endeavor Commerce, Envestnet, Envestnet/Yodlee, Equifax, Factiva, Fidelity Investment, FileNet, First Rate, FIS, Fiserv, Fisher Technology, FOLIOfn, Fox Financial Planning Network, Galeforce, Hidden Levers, Hilltop, Hitachi Solutions, Hoover, Hubspot, IBM, InaPlex Infosys, Investigo, iVobis, K2, KnowledgeSync, Laser App, Laserfiche, LexisNexis Risk Solutions, LPL, Markit (KYC.com), Misys, MoneyGuidePro, Morningstar, National Financial Services, National Financial Streetscape, National Planning, NaviPlan, nCino, Omni, OpenText, Orion, Pareto, Pershing, Portfolio Pathway, PreciseFP, Qgate, Radish Tools, Raymond James, Reischer CRM, RHUB Communications, RightCapital, Salesfusion, Scottrade, Scribe Software, SEI, Sharepoint, Silanis, Skience, Smartapps4, SSRS, Sterne Agee, Synergy Networx, Tata Consultancy Services, TCA, TD Ameritrade, TDAI, Team Knowledge, Tech Mahindra, Temenos, Tempast, Thomson Reuters TradePMR, Trust Co. of America, Veripark, Vineyardsoft, VirtualLogix Group (aka Linkpoint 360), Virtusa, Wipro, WorldCheck, Worldox, and Xarios Technologies.